Día de la Cruz (The Day of the Cross) is celebrated throughout Spain each year on May 3rd. This is a popular festival where crosses decorated with flowers (often carnations) are displayed in public plazas and alleyways throughout most town and villages. Throughout the pretty white village of Frigiliana, there are usually around twenty of these floral bedecked crosses adorning the streets. At each cross you may see shawls and fruit on display, as well as morcilla, chorizo, nuts, olives. The local villagers try to outdo each other with their floral tributes, and offer free tapas and the local sweet wine to visitors who stop to admire their handiwork. In the early evening, the village band conducts a tour of the crosses, followed by a group of folk musicians and dancers, all colourfully clothed in their best flamenco dresses. The Day of the Cross celebration in Frigiliana was a casualty of the Civil War and the tradition was only restarted in 1981. 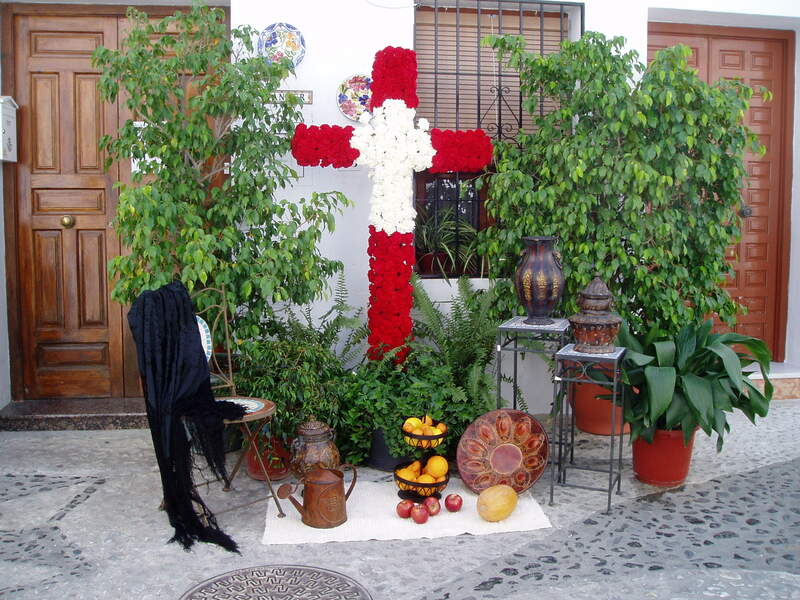 Unlike in many towns and villages, Día de la Cruz in Frigiliana is not a competitive event but a day to celebrate and enjoy the beautiful flowers and hospitality. Which is your favourite fiesta or festival in Spain?